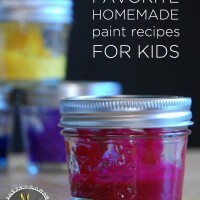 Have you ever made your own paint? 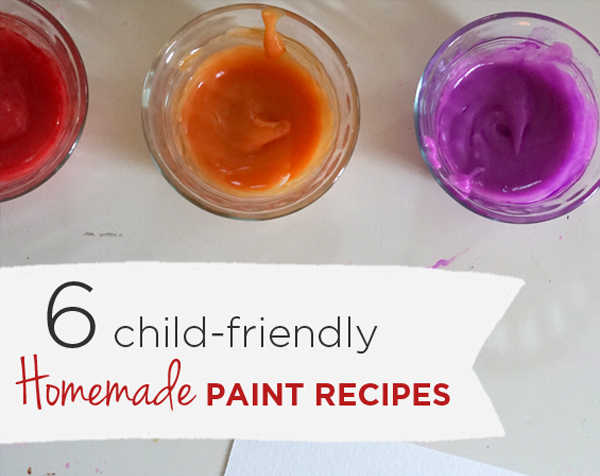 If not, these homemade paint recipes are just the thing to get you started. 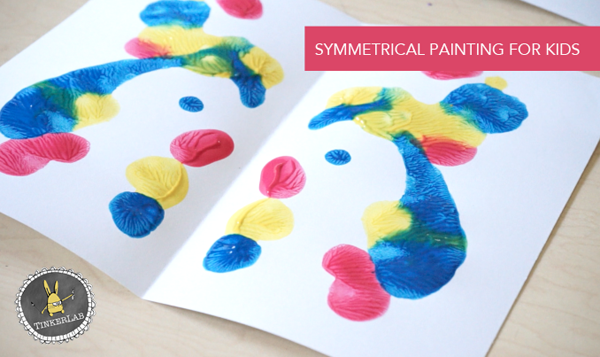 You’ll be surprised at just how easy, fast, and affordable making your own paint can be. It’s just plain fun to make things that you’d otherwise buy in the store. 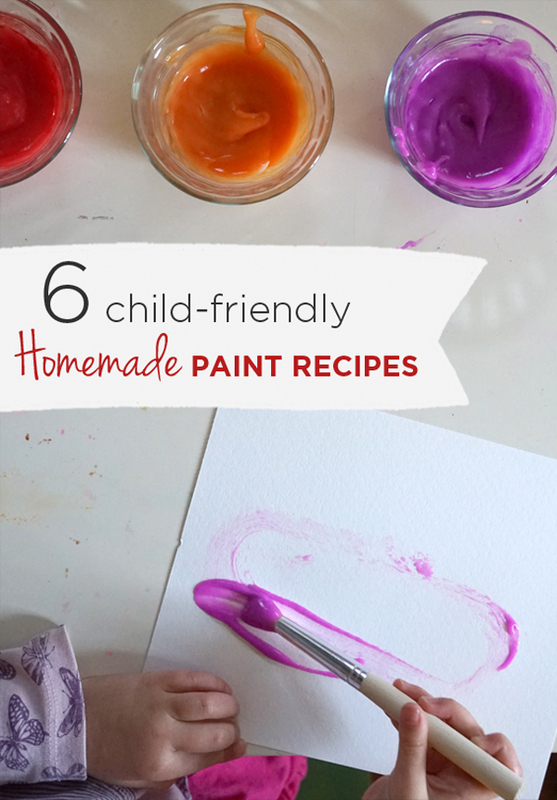 It can give you peace of mind to know that the ingredients in homemade paints are child-friendly. 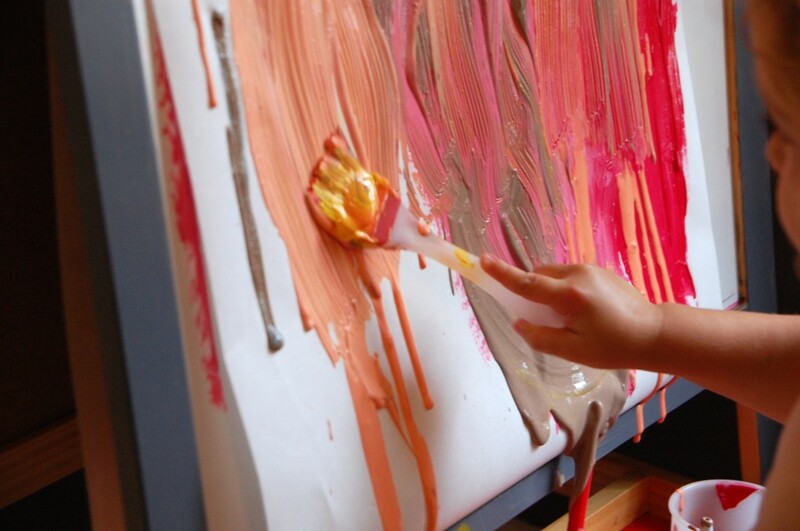 Making their own art materials teaches children to be resourceful and inventive. It could save you a trip to the art store. 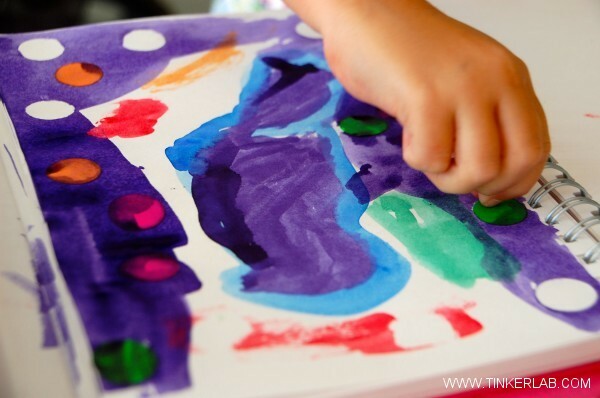 Puffy Sparkle Paint: Made from salt, flour, and water, this paint dries a little puffy and gets a bit of sparkle from the salt. 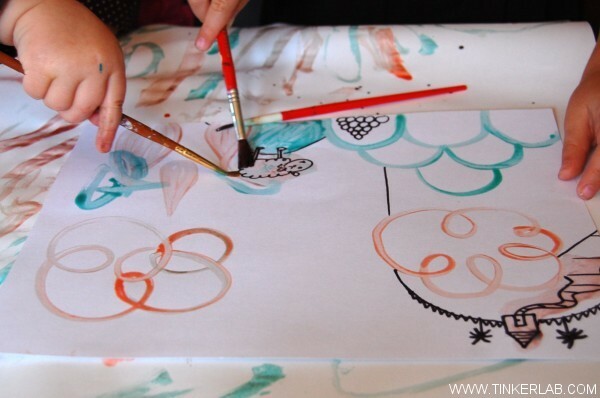 Fill an empty glue bottle with this paint, and squeeze designs onto paper. 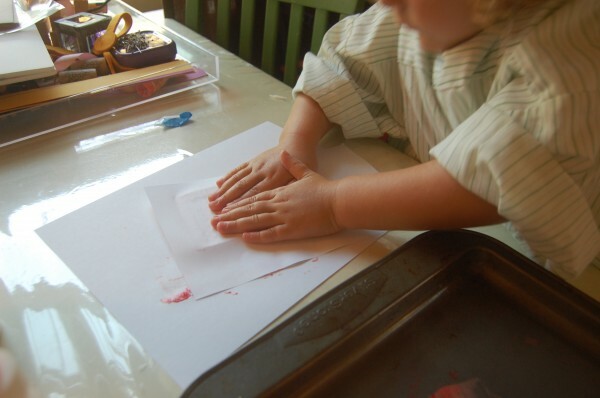 Finger Paint: A simple recipe of flour and water, heated over the stove, this goopy paint feels great on the hands. 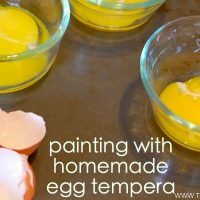 Egg Tempera Paint: This very easy paint, made from egg yolks, dries with a beautiful sheen can also be a great lesson in how the Renaissance painters originally painted. 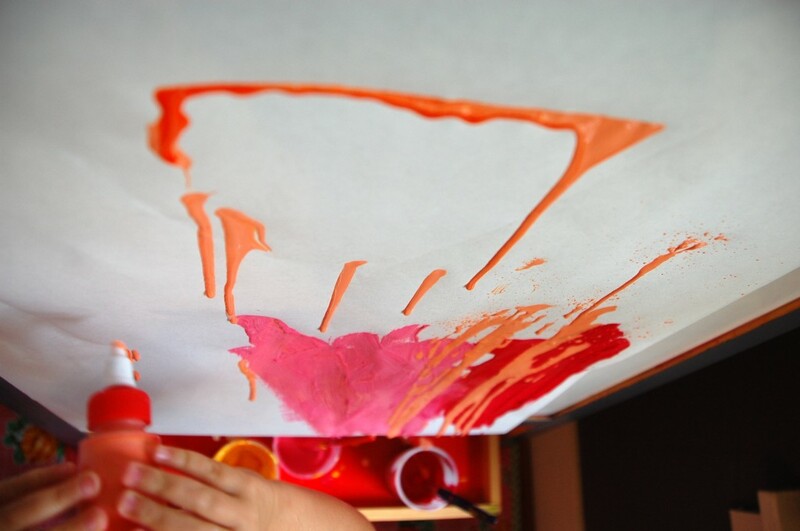 Microwave Puffy Paint: Squeeze this paint onto paper and then pop the artwork in the microwave for a truly puffy result. Very cool! 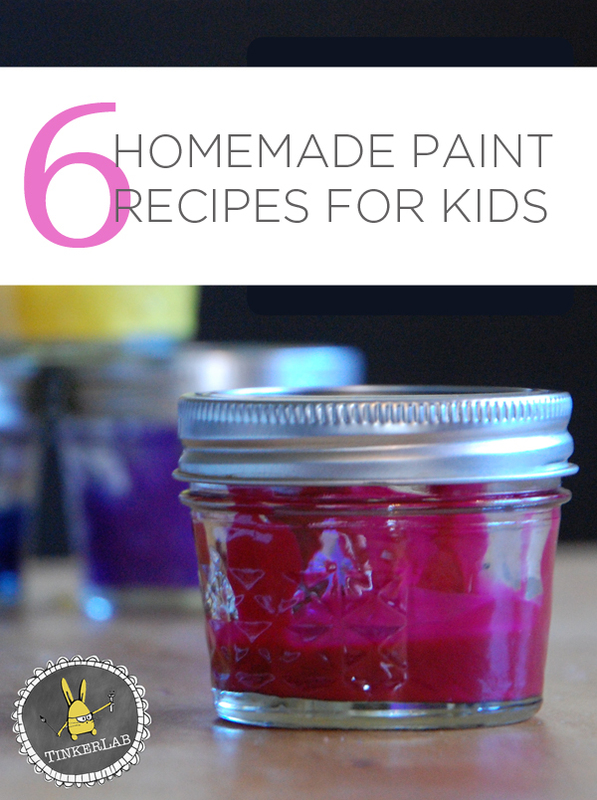 Sweetened Condensed Milk Paint: This may be the most delicious paint recipe yet! 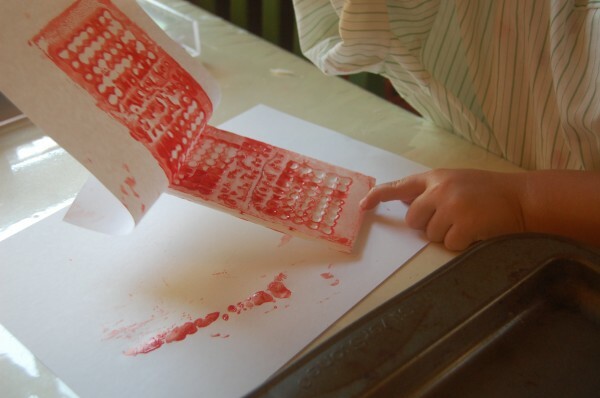 Invisible Ink: Made from citrus juice, this is a fun one for little sleuths and spies. 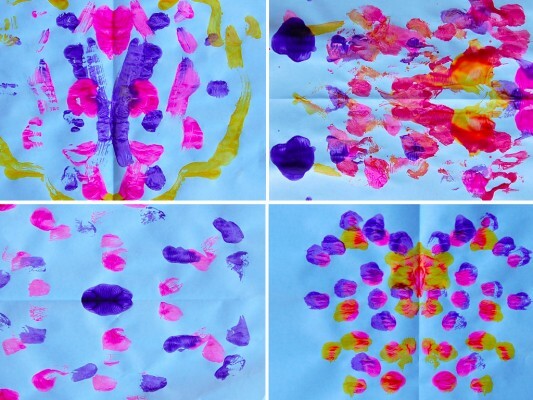 Bubble Paint: A mixture of dish soap, water, and tempera paint makes this magical solution that can be used to form bubbles on the surface of paper. 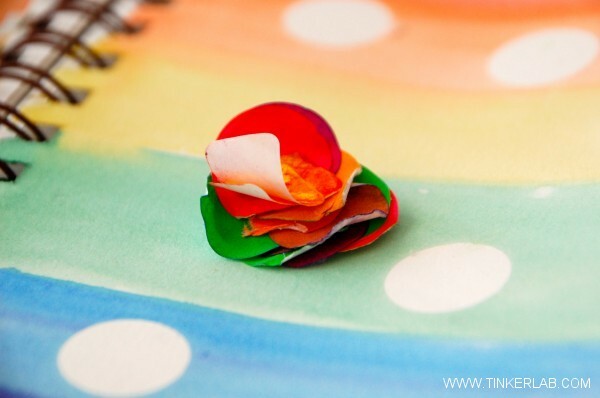 Jean Van’t Hul of The Artful Parent created this fantastic resource of 35 Homemade Art Materials Kids Can Make. 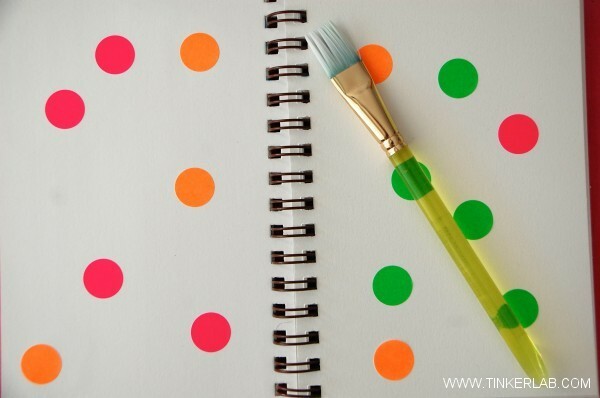 If you’re looking for a homemade paint recipe that’s not on this list, please add it in the comments and we will work hard to bring you what you’re looking for! Do you have a set of watercolors? If not, this fun project will give you reason to pick one up. 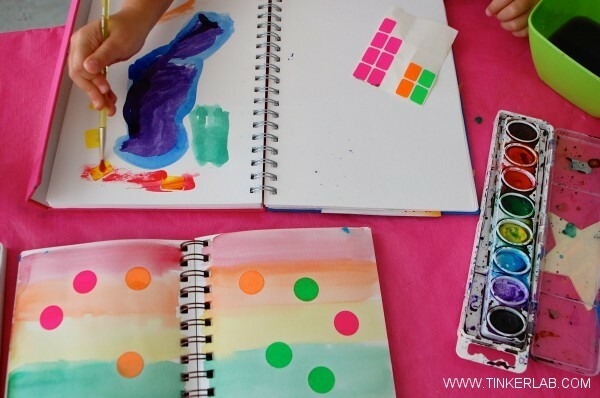 My kids and I have been keeping sketchbooks for a few months, and we enjoy the challenge of testing out new techniques, materials, and ideas as we move through our books. 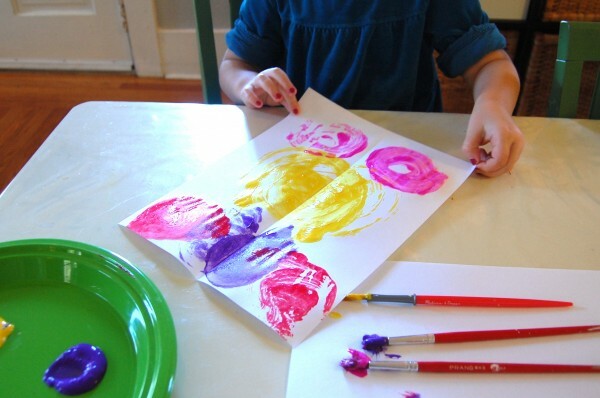 Painting over stickers (and then peeling them back) presents children with the opportunity to learn about masking off areas of their work, negative space, and paint-resist. 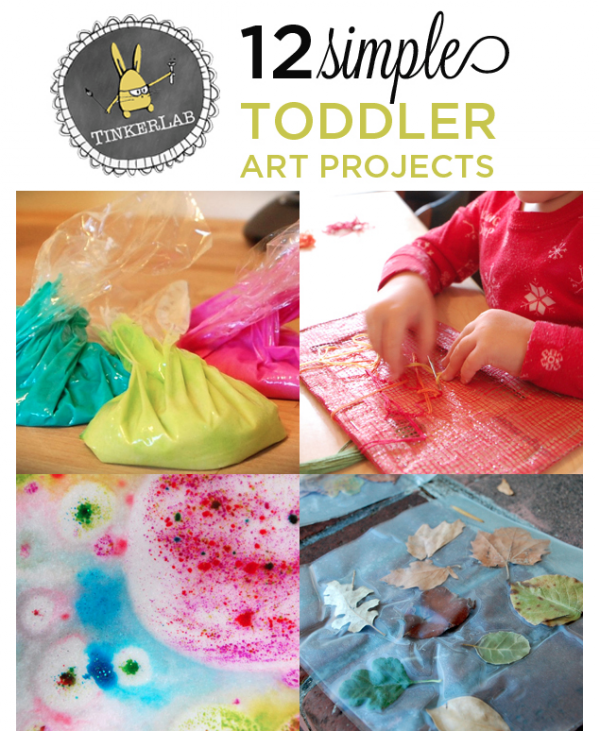 This project is ideal for preschoolers and above. 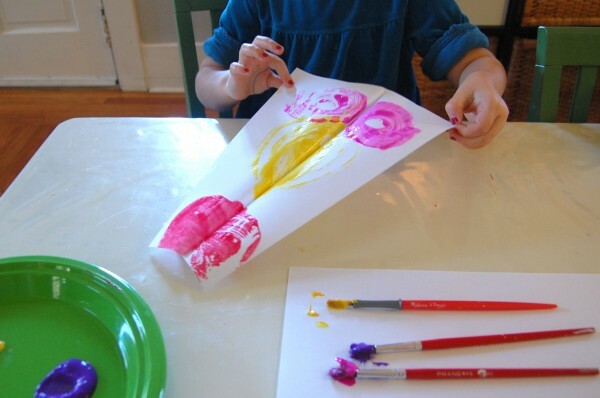 Paper Towels or rags for blotting paint. Sketchbook or Heavy Paper that can support a fair amount of water. Watercolor Paper is ideal. Office Stickers: Round, rectangular. Paper tape or kid stickers work well too. 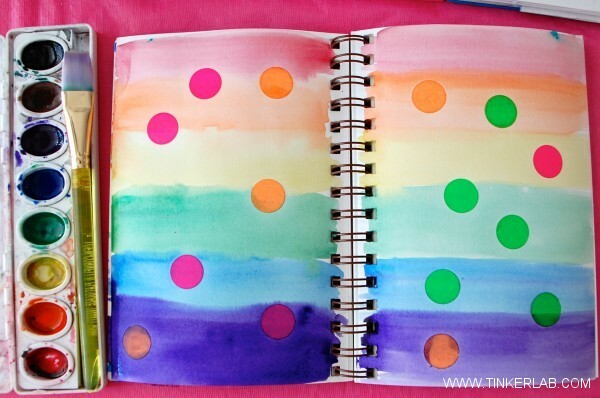 I started with a few sheets of dot stickers from the office supply aisle at the drug store, and then made a random pattern all over my sketchbook. Then I painted a wash of rainbow colors over the stickers. Nutmeg thought this looked pretty cool, and jumped in with her own version: rectangle stickers and free-form painted shapes. 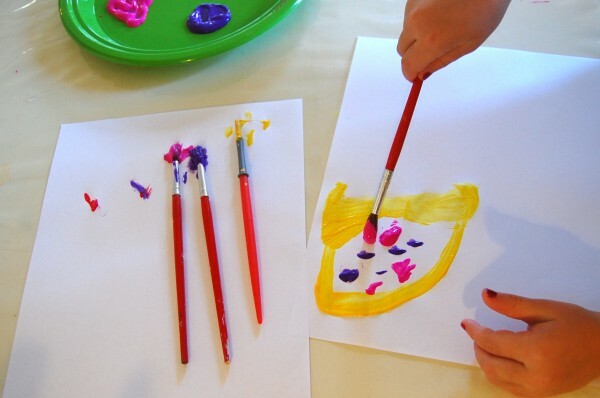 I always encourage children to follow their own ideas when making art. 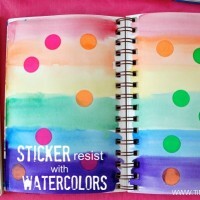 She peeled the rectangle stickers off the page to see how the technique worked, and then added a sea of circle stickers to the page. She asked if she could peel all of my stickers off — quite easily her favorite part of the whole project. 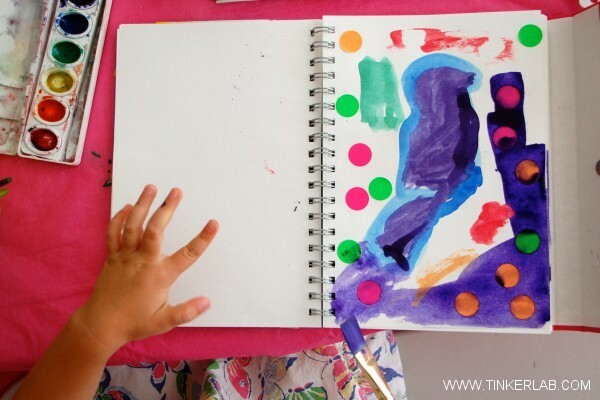 When the paint dried, she peeled all the stickers off her page to reveal the white space below. So fun! 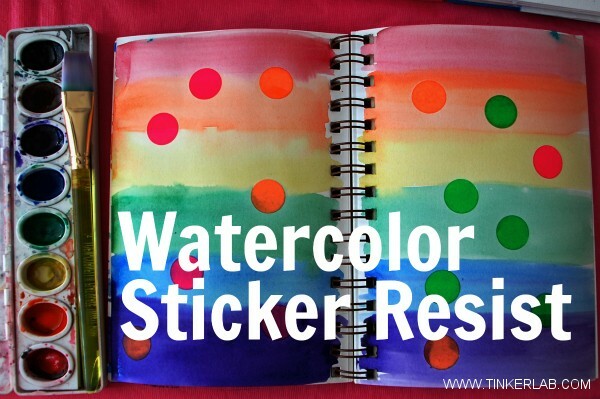 Paint over stickers, and then peel them back, to reveal the white spaces of the page. A lesson in negative space and masking as a resist. Place stickers on the paper. When the paint dries, peel stickers off. What do you think? 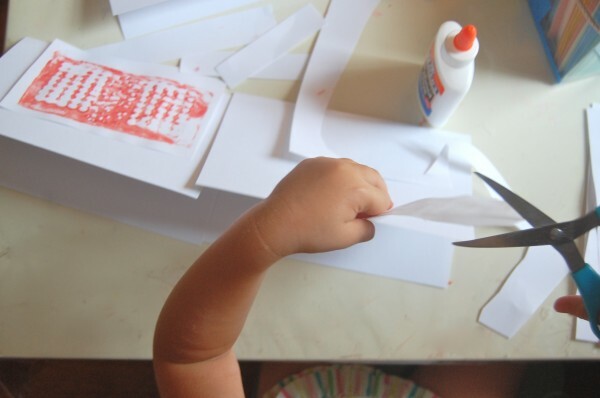 Have you tried other techniques for masking off paper? 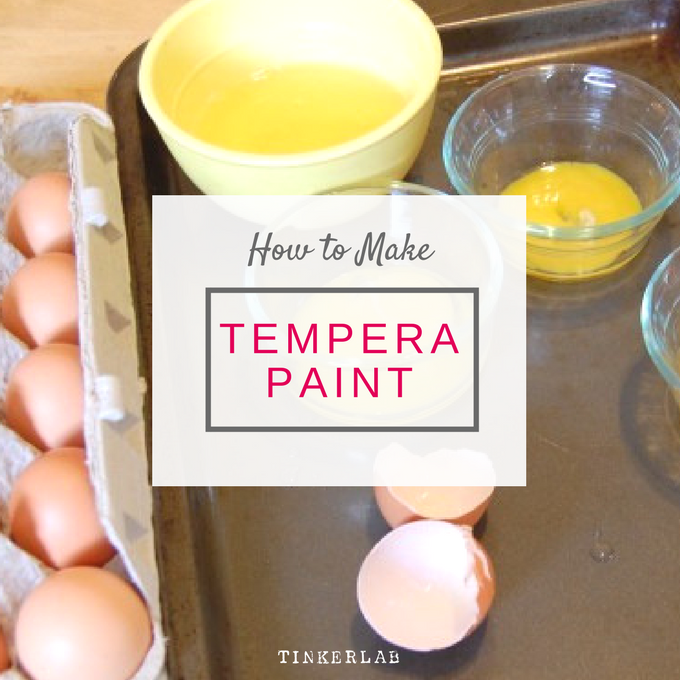 Today I’m sharing how to make homemade tempera paint. 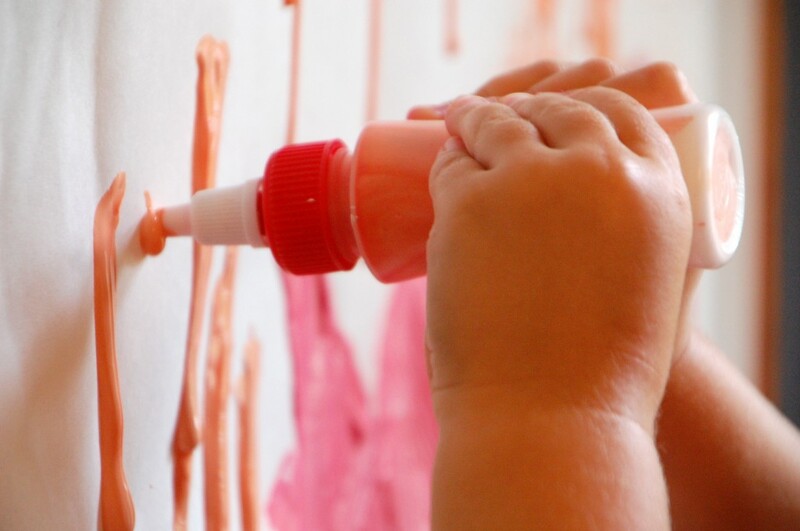 This paint is beyond simple, made from eggs and food coloring, and it will last indefinitely once dry. 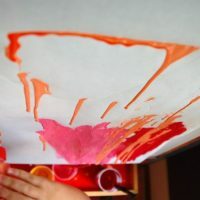 I’ve been interested in whipping up a batch of homemade egg tempera paint for a while, and was eager to try this with my kids. 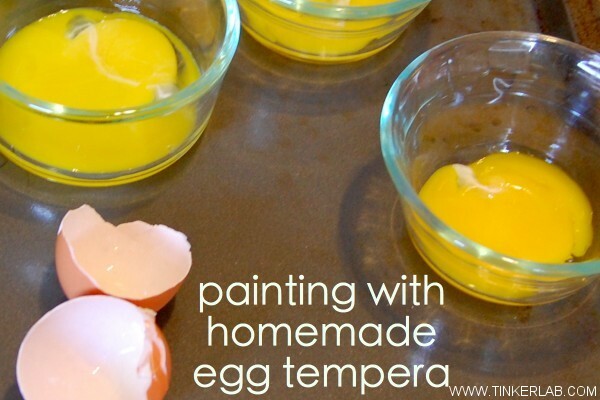 Do you know the history of egg tempera paint? It’s quite interesting, actually. Egg tempera was wildly popular amongst Early Renaissance artists (Botticelli, Giotto, Fra Angelico) and then fell out of use with the Late Renaissance artists (Leonard da Vinci, Michelangelo) when oil paint was introduced. 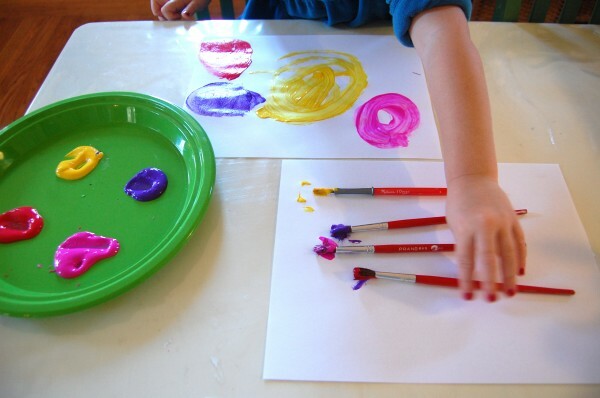 To make egg tempera paint, powdered pigments culled from things such as stones, sticks, bones, and the earth were mixed with water and then tempered with a binding agent such as an egg. And when they were tempered with eggs, they were called egg tempered paints and eventually earned the nickname Egg Tempera. Interesting, right? So this is where those big, bright bottles of kid-friendly tempera paint get their name from. 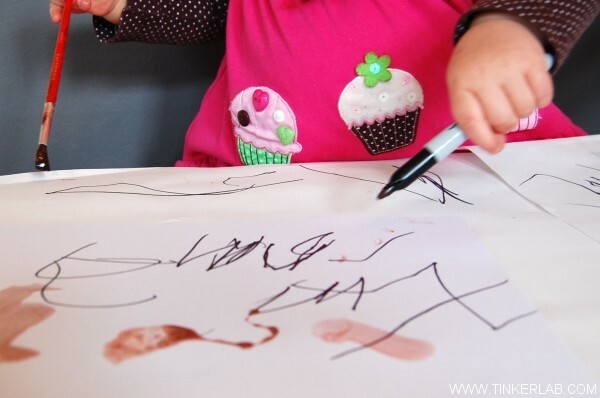 I borrowed this recipe from Kid’n’Kaboodle, and if you click over there you’ll find an enormous list of recipes that will keep your little artists busy for a long time. 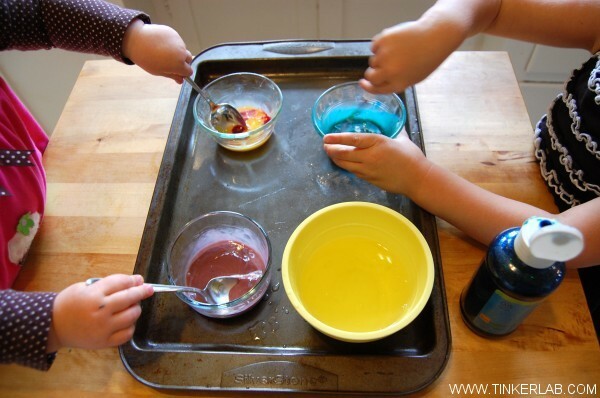 This project doesn’t take very long to set up, kids will enjoy making their own paint from eggs (unless they’re allergic or hate eggs, of course), and once the paint dries it has a gorgeous, shimmery patina that makes it painting-worthy. 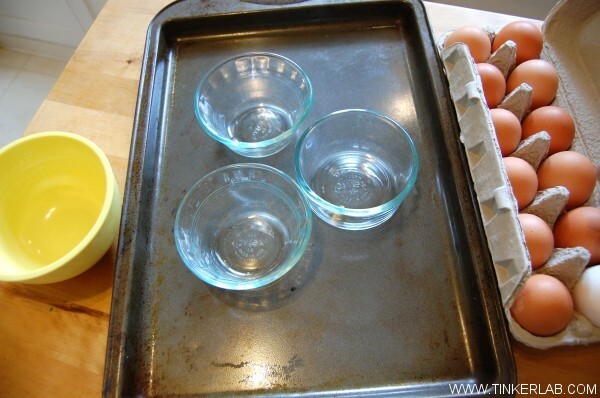 Step one: Separate the yolks from the whites, and drop one yolk into each of your bowls. 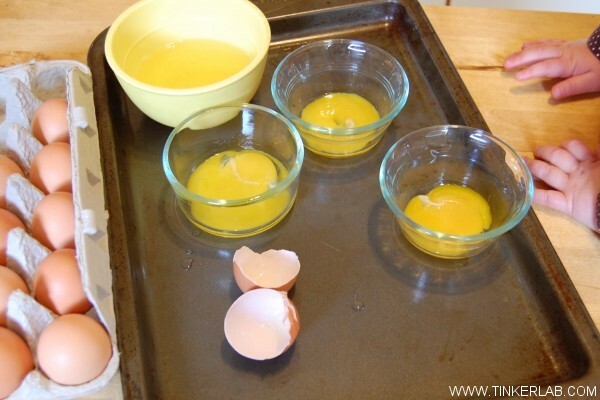 Separate the yolks from the whites, and drop one yolk into each of your bowls. My 3.5 year old chose three colors to add: Purple, Sparkly Red, and Sparkly Blue. 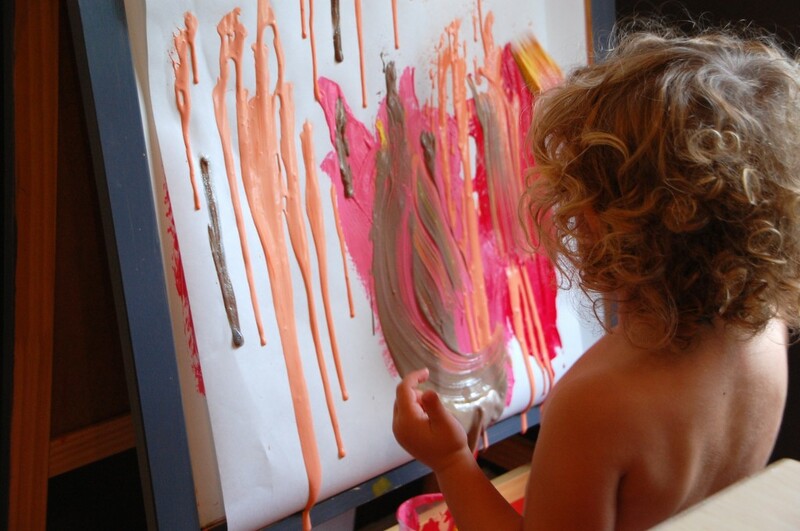 My favorite paint to add are Sax Liquid Watercolors. The bottles are inexpensive, last forever, and come in a huge range of colors. Seriously the best investment as we’ve had our bottles for years. As soon as my one year old began mixing the purple into the egg yolk, my older daughter commented on how purple and orange mix together to make brown. Not her desire, exactly, but she didn’t seem to mind and it was a great little unintended lesson in color mixing. 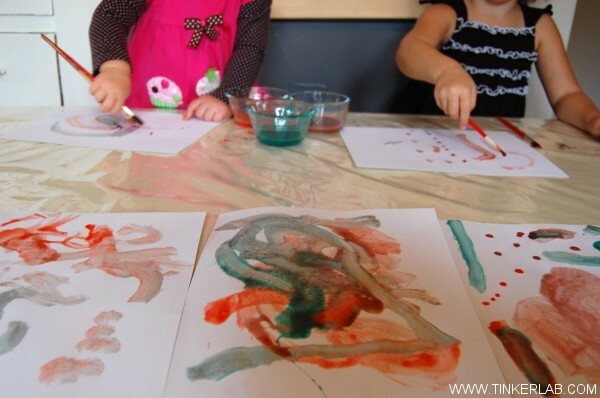 With our homemade tempera paint ready, we got busy painting. Quite a lot of painting, actually. I joined in too and it occurred to me that this transparent paint would make a beautiful luminous sheen over some bold Sharpie marks. I offered my kids Sharpies, and they thought it was a great idea too. Do your kids love Sharpies as much as mine do? My kids go bananas over Sharpies and I sometimes wonder if it’s because they really are all that wonderful or if it’s because I keep them on a super-high shelf, buried behind old taxes and holiday Silverware. This was a great move, and the effect was as pretty as I had imagined. 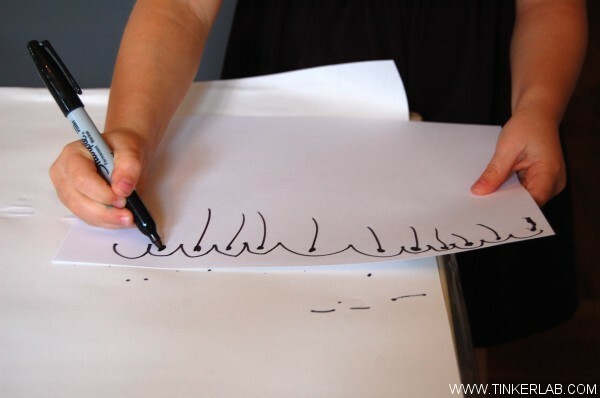 My toddler isn’t so deft with the Sharpie and I had to keep a sharp eye on her. 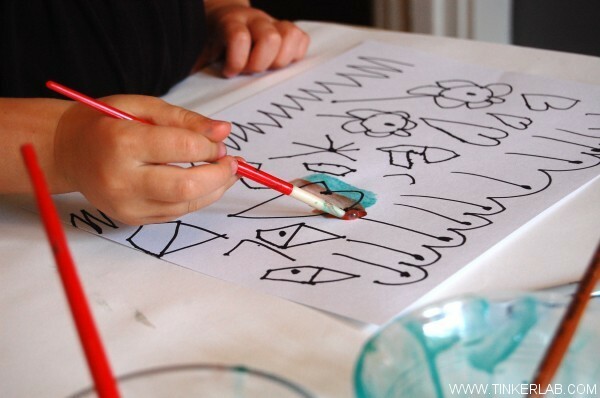 She also insisted on the famous paint-draw technique, which kept me busy. How I even snapped this photo I’m not sure. Before we wrapped it up, they wanted to collaborate with my on my drawing. Rainbow asked me to draw her a sheep, and then the two of them went to town painting in and around the scene. 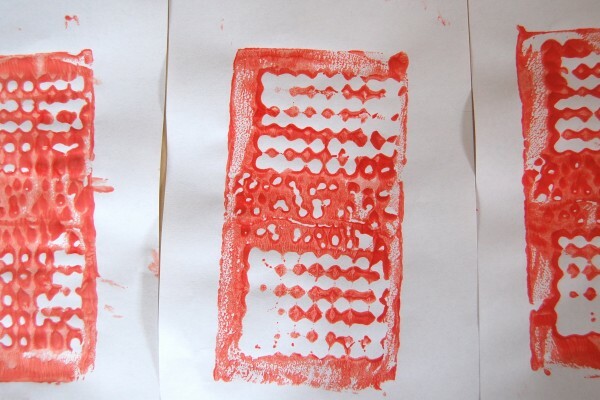 Printmaking is one of my passions, so we invariably make a lot of prints in my house. 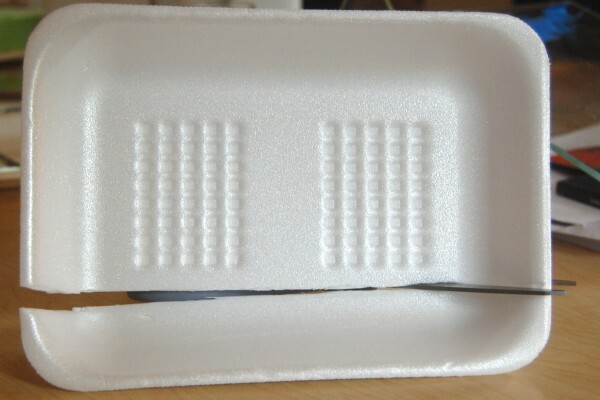 I was about to recycle a styrofoam tray (I think it was from a pack of corn) when N asked if we could print with it. Why yes, we can! 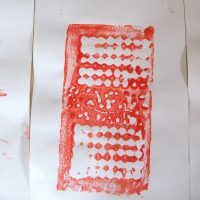 We’ve printed with these before (Abstract Recycled Prints) and the technique is the same except this time we printed the pattern found on the tray instead of creating our own design. 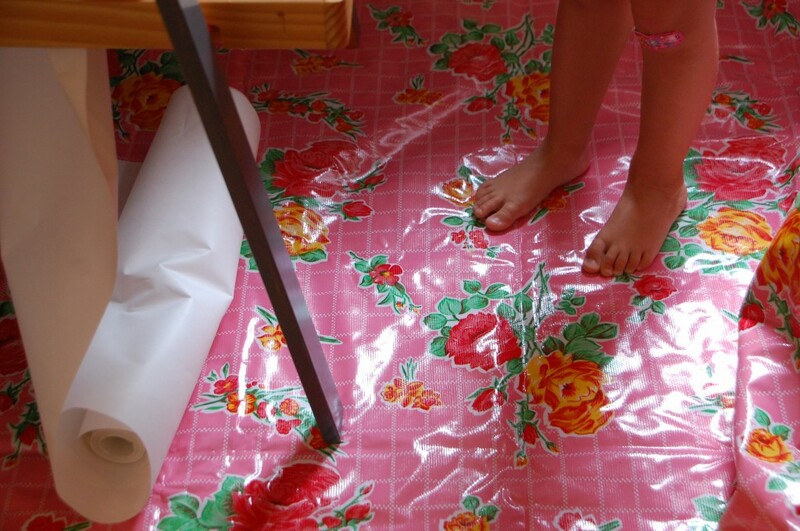 I like this project because it’s inexpensive, helps children look to their surrounding for inspiration, and utilizes the pattern found in the tray. We cut the tray into a flat piece. 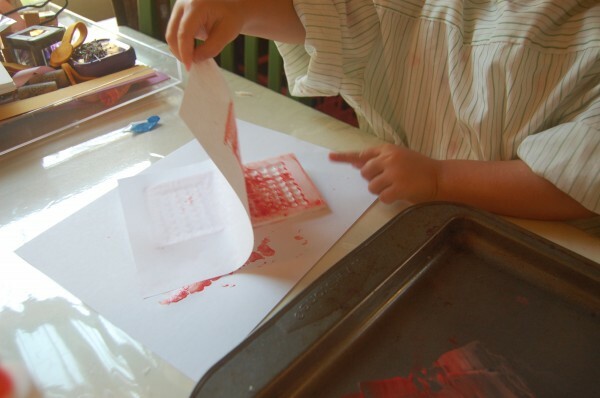 My daughter squeezed tempera paint onto a cookie sheet, rolled it with a brayer, and then rolled it onto the styrofoam tray. She chose a red + white paint combo. 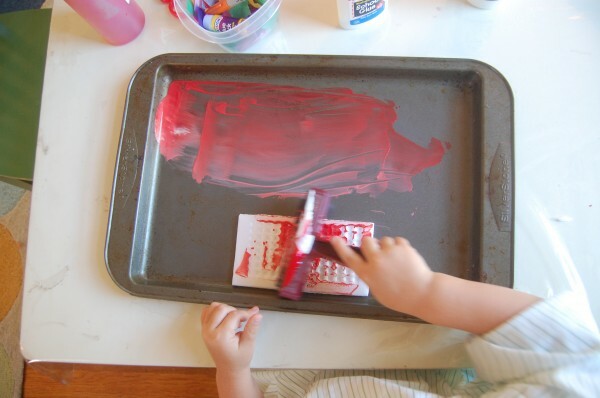 She moved the tray (or “plate”) onto a clean sheet of paper, covered it with another piece of paper, and then pressed it to transfer the paint. Checking the print. Yay — it looks good. Carefully peeling the print off the plate. 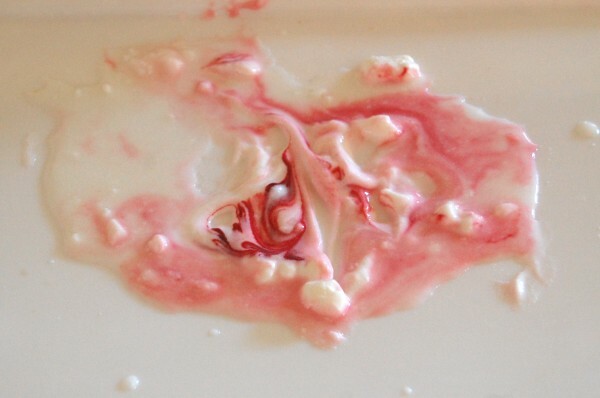 I scooped some yogurt onto her highchair tray and added a few drops of red food coloring to match our paint color. (The food coloring, India Tree Liquid Natural Decorating Colors , is made from plants and completely natural. I love that I can feel safe giving this to my kids). 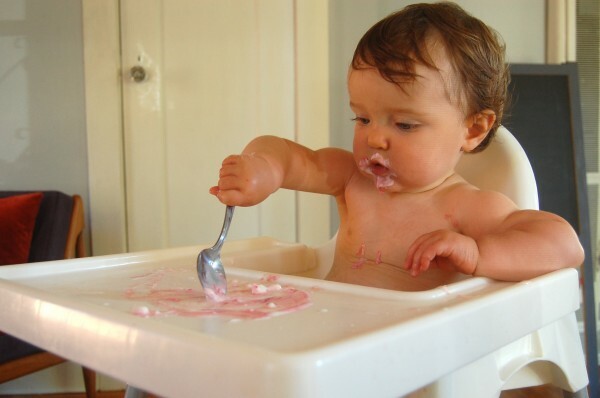 While Nola continued to pull prints (without the distraction of baby sister grabbing her papers), the baby happily stirred her paint and ate away. 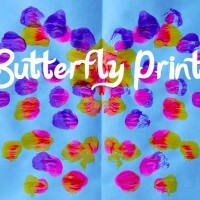 Prints, and most art projects for that matter, often get turned into other projects. N decided this one should be glued to a card. 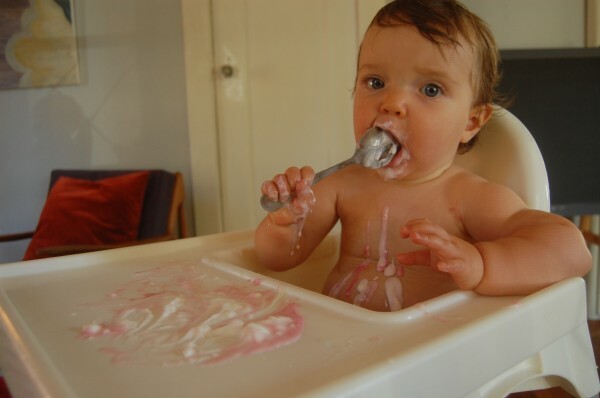 And Isla continued to enjoy the activity until is was all gone.